UltraLife Blue Green Slime Stain Remover is a revolutionary time tested product, that will efficiently and safely remove Blue Green Slime Stains from your freshwater aquarium. One of the most significant challenges with freshwater aquariums is that creeping blue-green slime that appears over time, but now there is a solution. 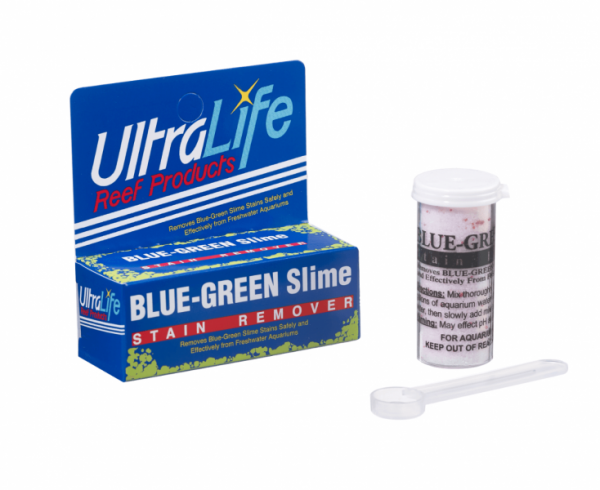 Ultralife Blue-Green Slime Stain Remover has been specially formulated to combat the problem of blue-green slime, using a secret mix of natural ingredients, supplements and biological accelerators to provide the ultimate blue-green slime stain remover. It is easy to use, just mix a small amount of aquarium water, with the appropriate amount of product, using the included measuring spoon according to your aquarium size, and then merely add straight to your aquarium water. There is no need to change the water or filtration system, making this an impressively practical solution that can be accomplished in minutes. It is entirely safe for all freshwater aquariums, and available in several sizes to keep your aquarium slime free. The safe formula is harmless to fish and corals, but it is also safe for beneficial macro-algae and nitrifying bacteria. UltraLife BGSSR will accelerate the solubilization and biological digestion of organic solids. In the process, the oxygen uptake rate in your aquarium will increase as a result of this increased biological activity. It is critical that your aquarium can support this increased oxygen demand along with your aquatic life’s need for oxygen. Therefore we recommend increasing your O2 levels by the addition of airstones before and during treatment. Thoroughly mix 2 level spoonful for every 15 gallons of aquarium water with a small amount of water from the aquarium to be treated. Pour dissolved solution into the aquarium. Repeat after 48 hours if necessary. Wait at least one week before additional treatments, if necessary.